Where to Ski And Snowboard - Pricey French transfers, or not? Pricey French transfers, or not? You may recall our 2010 rants on arranging independent transfers to French resorts, for individuals or small groups. Google “Geneva airport ski transfers” and you get a healthy list of possibilities. The mind boggles. What to go for? Prices vary enormously. You could spend hours checking them all too. Transfers to French resorts are tricky unless you use a private minibus service. These are numerous but can be fiendishly expensive for small groups or couples as we concluded. And special bus services to the resorts also proved a pricey amount; in some cases costing more than the return flight. Back then, we worked out that hiring a small car for a week was cheaper than paying a dismally high £430 to £1,170 for the return trip. Next we checked out Easyjet’s not-so-special offer: a taxi for four cost £542 return – and that was the cheapest fare. A year or so on, and the options are widening at least. There are competitively-priced alternatives to self-drive. Taking this problem in hand and opening up a new market of affordable transfers are tour operators. Independent tour operators will usually offer some sort of transfer for their guests, whether a coach or minibus, at an additional cost. What you may not have realised, is that some companies are now extending those services to guests not booked into their property too, and improving the facility for more flexible timings and options. These certainly work out cost effective for smaller groups too. Ski Amis offers fully licensed shared minibus services to/from Geneva and Chambéry airports, and serving the Three Valleys, La Plagne Montalbert and Peisey-Vallandry mainly. They’ll fetch you from the airport and take you to your accommodation for a very competitive £75pp return for four people or more; £100pp for two. This is very good value for the distance, and you’ll get a pleasant door-to-door service that aims to keep waiting times to a minimum. We tried this with our group of seven in La Tania, and it all worked exceedingly well. We were met on arrival, and taken right up to our chalet front door. The return journey was punctual and allowed sufficient time for the staggered flights – two of our party were able to switch to earlier flights and save time on their routes home too. The company operates a fleet of minibuses, so there are enough to cover the various resorts. And they will also operate a dedicated service to other areas / airports on request. Prices start at £700 per vehicle for a group of 1 to 8 people. New for 2011/12 Megève specialist Stanford Skiing now offers low-cost, direct and reliable minibus transfers to and from Geneva airport. This is also open to everyone, not just their own guests. There are timed Sunday transfers, free to chalet guests or £15 for non-guests, shared and priority transfers. Costs start at £25pp for six or more skiers in a party on a daytime system, or a little more for evening arrivals and departures. A priority booking is one arranged around your own requirements and costs from £60 per vehicle. Ski-dazzle.com also runs minibus services to and from La Tania, aimed at their own guests and a minimum of four people travelling together. Other good deals that we have found include BensBus – a good example of a low-cost alternative to the private taxis, and now operating from Geneva airport as well as Grenoble. The price for a transfer to Méribel or Bourg-St-Maurice, for example, is £73 per person return. This is available to skiers travelling on weekend days (Saturday or Sunday), so works best for a week’s holiday. Compare that with similar quotes of £280 or more gained elsewhere. We also looked at Holidaytaxis.com - which covers over 400 resorts in the Alps. 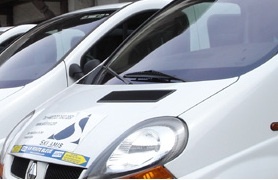 The price for a scheduled shared transfer worked out at £174.74pp. A ski taxi was £653 per vehicle and a minibus carrying five or six people was £757 per vehicle (about £150 each). So, immediately the tour operator minibus services look very attractive. As for last year’s pricing, Alpski-bus will now set you back 131 euros per person return (Friday to Friday travel) or 420 euros for a private minibus (per bus). Ouch! Currently Carhire3000.com, our outfit used last year, has discounted rental fees for January; the cheapest price is £190 – split among three or four people that still makes it a cheap option. But then you have fuel costs and the hassle of driving to the resort yourself, plus parking once you get there.